Fig. 1: Illustration of how a particular iceberg might be represented by the new tabular iceberg model. Overlaid on the iceberg are the outlines of hexagonal elements, with interaction lines between the element centers. 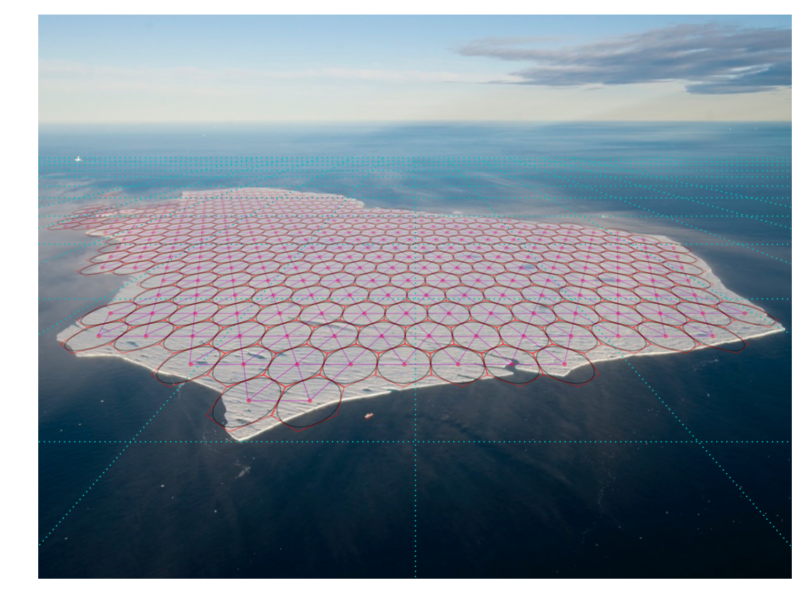 Overlaid on the ocean surface is a schematic of an ocean mesh, indicating how the tabular iceberg could be larger than an individual ocean grid cell. What is special about large tabular icebergs? Large tabular icebergs can be 100s of meters deep and of order 10s to 100s of kilometers on a side. They break off from ice shelves in “calving events” and account for about 90% (by mass) of all the ice that is calved from the Antarctic ice shelves. For context, about half of the mass loss by Antarctic ice shelves is due to calving, the rest through basal melting. The calving events that create large tabular icebergs are infrequent, often with many decades between events. The resulting tabular icebergs have long lifetimes due to their immense size, sometimes lasting a decade. They drift in the ocean for long distances, interacting with the local ocean circulation, impacting bottom-water formation, sea-ice formation, and biological productivity in the vicinity of the icebergs. However, due to their large horizontal extent and mass, it is challenging to consistently represent large tabular icebergs in global ocean circulation models and so large tabular icebergs are not currently represented in our coupled earth system models. Fig. 2: Illustration of how a large iceberg can be built from a particles smaller than the ocean grid. 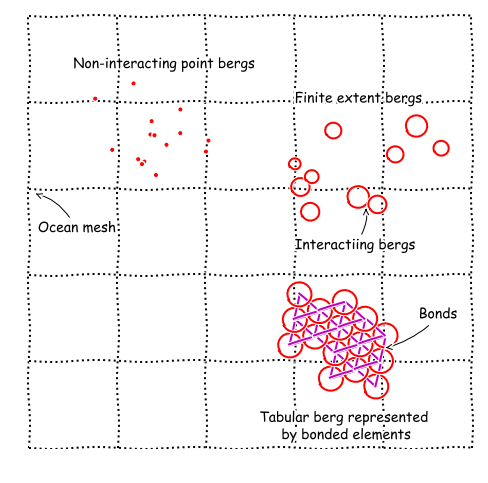 The original point-particle iceberg model of Martin and Adcroft, 2010, had particles which only interacted with the ocean, not with each other. In Stern et al., 2017, the particles are given finite extent, can interact with each other, and can be bonded to represent larger bodies. At GFDL, we have developed a novel framework to model large tabular icebergs submerged in the ocean (Stern et al., 2017). In this framework, a tabular iceberg is represented by a collection of Lagrangian elements that are linked through rigid bonds (see figure 1). The Lagrangian elements are finite-area modifications of the point-particles used in previous studies to represent small icebergs (Martin and Adcroft, 2010; Stern et al., 2016), see figure 2. These elements interact with the ocean by exerting pressure on the ocean surface, and through melt water and momentum exchange. A breaking of the rigid bonds allows the model to emulate calving events (i.e. detachment of a tabular iceberg from an ice shelf), and to emulate the breaking up of tabular icebergs into smaller pieces. Idealized simulations of the calving of a tabular iceberg, subsequent drift and breakup, demonstrate the capabilities of the new framework with a promise that climate models may soon be able to represent large tabular icebergs. In the animation below we show a simulation of an idealized calving event in which a piece of ice is detached from an ice shelf. The top panel of the animation shows the surface temperature in color, and white/grey indicate thick/thin ice (ice shelf or iceberg). The ice shelf is to the left and open ocean to the right. The dashed line indicates the location of the vertical section shown in the lower panel. In the lower panel, the colors represent interior ocean temperatures. The profile of the ice is evident because ice displaces water, which we properly account for in this model. The model source code is open source/open development and known as KID (Kinematic Iceberg Dynamics), part of the family of models we use at GFDL to simulate the coupled earth system, and can be found on GitHub at NOAA-GFDL/KID. Martin, T. and A. Adcroft, 2010: Parameterizing the fresh-water flux from land ice to ocean with interactive icebergs in a coupled climate model. Ocean Modelling, 34, 111–124, doi:10.1016/j.ocemod.2010.05.001. Stern, A.A., A. Adcroft, and O. Sergienko, 2016: The effects of Antarctic iceberg calving-size distribution in a global climate model. Journal of Geophysical Research: Oceans, 121, 5773–5788, doi:10.1002/2016JC011835. Stern, A.A., A. Adcroft, O. Sergienko, and G. Marques, 2017: Modeling tabular icebergs submerged in the ocean. Journal for Advances in Modeling Earth Systems, 0, 0–0, doi:10.1002/2017MS001002.